Between the incoming search terms logged at AdeptGamer and here at my blog, I decided to address a few common questions. Note: This FAQ does not cover the changes and additions from version 1.10 (Feb 13th, 2013 update) and onward since I’ve lost interest in the game. Note #2: I lied. 5 new job recipes added to the spreadsheet and one new question about the Dating Agency was added here. Note #3: This FAQ and the spreadsheet will most likely not cover version 1.30 and beyond. Q1. What are the all the formulae/recipes/combinations for all the jobs? A1. I put together a handy spreadsheet that’s useful for taking out the guesswork when you have a bunch of highlighted/new jobs to discover: https://docs.google.com/spreadsheet/lv?key=0ApJcOk7MQHDMdHVmS09kMXJQTjVoemNTQlJGR2RMS3c&rm=full#gid=0. There is a slight flaw in this in that you can’t actually pull up every single combination when choosing either Column B or C because only one version of each equation is listed. For example, searching Architect in Column B will get you Flight Controller, Interior Designer, and Real Estate Agent. However, you can also get a Landscaper from Assistant + Architect. It won’t show up because Architect is in Column C.
Q2. How do I unlock the Explorer, Salesman, Dreamer, or Mutant? A2. They can only be unlocked through Special Events. Truthfully, I have no idea about the first three but I’m guessing the criteria have to do with number of jobs total discovered or how much you’ve expanded. The Mutant appears once you reach 149 jobs. Q3. How do I unlock < name of building/workplace >? Q4. Is there any point to building roads or waterways? A4. Short answer: No. Long answer: They’re mainly for aesthetic reasons and a means to organize your city. If you lump everything into one big mass of colours, it’ll look kind of messy, wouldn’t it? (I suppose if you had enough Utopium, you could always make a city layout with trees in place of roads.) Oh, there are also some achievements based on building a certain number of roads and waterways. Q5. How do I extend Working Time? Yeah, many buildings initially have really short production time which means you’re pretty much glued to the screen and tapping on them every 5 – 10 minutes to keep them from going idle. However, you should notice that every work place will state that you can upgrade a facility by unlocking “Tech Support”. This is a building that you can get when you unlock the Programmer or System Admin job. (I’m not sure if it’s both or just one of them.) 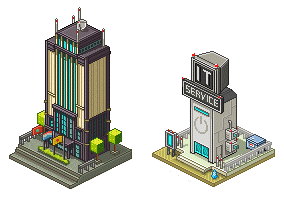 Tech Support allows you to extend working times by levelling up buildings, but the amount of time you can increase is dependent on the building. They all max out at level 5 but in terms of production time, some have a limit of 20 minutes while others can be in excess of 10 hours. These upgrades are not cheap since they cost 3u per level. The cost never increases though. Additionally, there’s also another useful work place called the Enterprise. Constructing this will automatically DOUBLE the working time of ALL buildings. Subsequent structures that you’ll build are also included. The catch is that it’s an in-app purchase since to make use of this nifty bonus, you’ll have to shell out a whopping 99 cents. The Enterprise building is unlocked when you create the Industrialist at the Arrival Center. Enterprise and Tech Support – 2 useful buildings that’ll get your workplaces to churn out coins longer. Q6. What is a Quick Surprise? It’s in reference of the Surprise thing from the stork but *only* when you fill up the remaining hearts in the heart gauge with the Accelerate function from the Gene Pool. Full explanation: When you construct the building, which is unlocked with Geneticist, you will have be given the option to fill up any missing hearts with 2,000,000 coins. This means that you no longer need to go around residences and hold the Heart symbol until it fills up. As there is an achievement for obtaining 100 quick surprises, you can keep using Accelerate as long as you have the funds. Q7. Is there any other method in obtaining animals other than the Surprise delivery? A7. Sadly, I don’t believe there’s an alternate way of getting animals other than filling up the heart gauge to get the random Surprise delivery. But hey, the Research Lab can reduce the number of hearts needed (up to a maximum of 6 hearts). Unfortunately, each reduction costs 10 Utopium. The price does not increase with subsequent purchases though so you’re looking at a total of 60u. You can always hang onto to your premium currency in favour of the Gene Pool instead because you’ll be getting 1780 cps once all positions in every unique building are filled. At that point in time, it won’t take very long to get 2,000,000 coins for a Quick Surprise. Q8. What’s strange about the Altar? A8. After you uncover 150 jobs, the Mechanic from the Arrival Center will say “… there is something strange about this building. I wonder what happens next?”. Here’s what happens — these screenshots were taken seconds between each other. Edit on March 25th: Screenshots removed since what occurs in the images happen even without the Altar. Thanks to BÖRĒD in the comments below for the info~! So as it stands, no one knows what it does. Q9. What does the switch in the Dating Agency do? A9. Fill Utopia with love, apparently. As far as anyone knows, it simply changes the little coin icon and white or green numbers popping out buildings to hearts. Your capital will continue to grow despite the cosmetic change. Hey, nice article! However, I was wondering about what’s written in the town hall under hints. “Grey mean nothing … and GREEN is just eww.” I have made all my people and I have never stumbled upon a green mix(potion). Is it available or is it just something they wrote for fun, without actual green stuff? I’ve never seen it either. Maybe it’s just in reference to something that was originally in the game but they never added it in in the final version? Or perhaps it’s some nod to one of their other games? Not sure. green is a hidden or mystery character such as the masseuse. I’ve not been able to splice any clones since altar appeared.. What am i gonna do now? You probably already know but the newest update gives you the Romantic via Surprise so you can get the remaining 5 jobs. Nooooooooooo! i’ve unlocked all the jobs – all 155 – and I can’t splice anymore. 😦 how do I fill those vacant jobs? You can re-splice jobs again. You are wrong about the altar, the curious citizens backrounds changed anyway. How do you share formulas on Facebook so the game recognizes it as an achievement. Not sure if it’s a bug in the recent update but when I did way back when, it went through as an achievement all right. I hate that the trees sprout along side the roads now! Is there a way to disable that or change the trees that grow? Sorry, I wouldn’t know since I haven’t played Pixel People in over a year. .___. There’s a yellowish thought bubble with a white exclamation mark over my arrival center. Anyone know why?